OK here it is the final FF before the Crypts and Things Kickstarter opens this Sunday March 1st. Last time out I said that I would talk about the stretch goals. About 40 or so, depending how excited I get. This really was my favourite bit of the book last time round, so I’m revving my self up to do this 🙂 I’m looking to add a few more subtle horrors as well. Things that once the players rush in to fight them, they wish they hadn’t afterwards. I’ll still be keeping the familiar vanilla spells in there, since it’s a big design goal that if you are familiar with Old School D&D (or any D&D for that matter) you can easily pick up and play C&T. However there is room and scope to add more spells that really bring White and Black Magic into high-definition, without sacrificing this familiarity. I’ve also 25 or so magic items that didn’t make it into the final cut last time out. They aren’t bad by any means but I had run out of development time. So if we hit this Stretch goal I’ll finish this off. I also want to do intelligent weapons, the right way ! 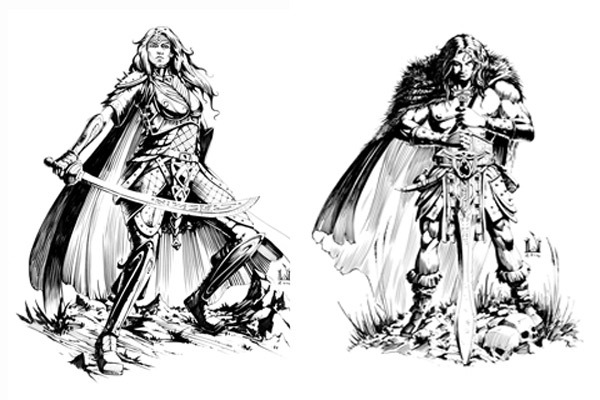 So we are talking Demon Swords and the like, the siblings of Stormbringer. These are the big bads of Zarth. These will be presented as a write-up of the warped and twisted religions that follow them, which if relevant will give stats not only of the Greater Other itself, but also the creatures and Cultists that follow it, and associated Magics that come from it. I purposely kept the setting, Zarth, light in the original release. Its flavoursome enough to give enough inspiration, but I got a lot of feedback asking for more detail. If we reach this goal, I’ll add a layer of details, such as adventure seeds, important NPCS in a nice Gazeeter. As well as the existing Adventures (Blood of the Dragon and Tomb of the Necromancers) I’m also offering up a conversion of the existing OpenQuest adventure Life and Death as an add-on in both pdf and print. This is a four-part epic where the adventurer’s actions decide the very fate of the world. It’s a bit more of a story driven experience than a standard Dungeon Crawl, but there’s lot in-built into the structure to prevent this from being a railroading experience. Also its much bigger than the previous C&T adventures releases clocking in at just over 100 pages. So that’s it until the Kickstarter starts this Sunday…. Art Preview – I show off some of the awesome art already done for the new game by David Micheal Wright. Why Crypts and Things Remastered? – a bit of the history of the game’s intial development and why I’m redoing it, the scope of the redevelopment and what’s going to be in the stretch goals. Crypts and Things Remastered Kick Starter opens March 1st The cover in all its glory. The Sorcerer The revised Magician class (because one of the biggest bits of feedback I got was that I should change the name to the Sorcerer). Look close and you’ll see some of the system changes in the class description. Magicians of Zarth. Other types of magic users in the setting. Note these are non-player character types, and will be written up as monsters.